Drawing tarot cards from the Major Arcana will help you to find the answers to almost every question. The Major Arcana are 22 picture cards, which all have different meanings depending on whether the card is drawn in the upright position, or upside down. Predictions from tarot cards are extremely popular, and seem to be growing in popularity. Many people believe that the cards will reveal the future to them, point the right way, and steer their fate in order for everything to fall into place. Tarot cards provide guidelines, but they will never tell you what you are really waiting to hear. Everything depends on you, because each of us takes personal responsibility for our own life. Nevertheless, the prediction shown on the card can, in some situations, be very valuable and informative. Tarot cards are only meant for adults who have contact with tarot cards. If you do not know anything about divination with tarot cards, you are very welcome to choose another form of divination. Try for a moment to reflect on the question that you want to ask the cards. Do not repeatedly ask for the same thing, because if you do this, you will not get the proper answer. Once you know what you want to ask, draw a tarot card. This will give you a prediction. Perhaps it will show you the solution to your problem or the right way out of a situation. 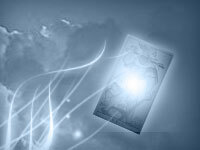 Tarot cards also help you to find an answer to every question - it all depends on it how you interpret the drawn card.